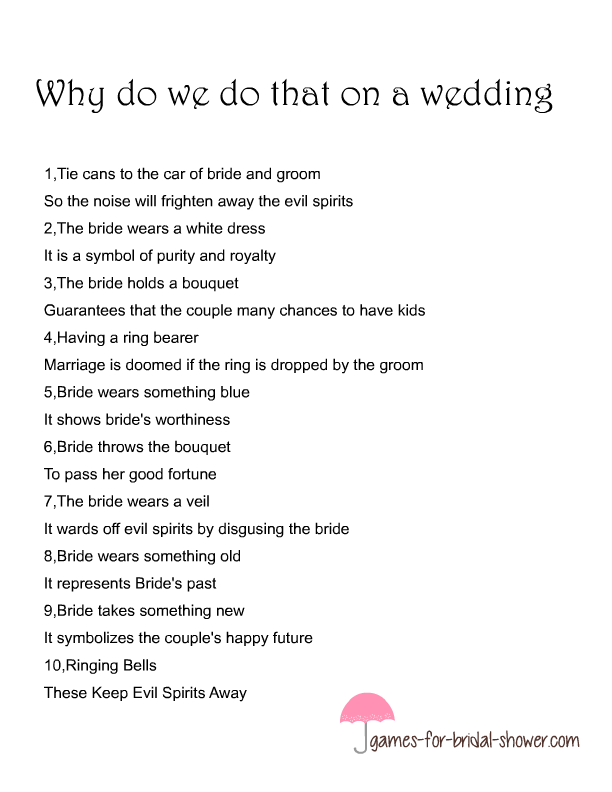 There are many superstitions involved with the wedding traditions and rituals. 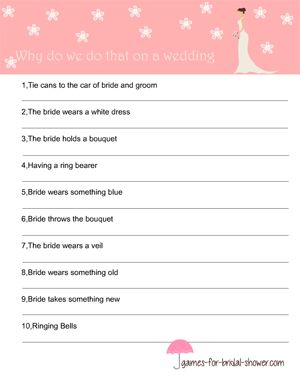 This is a fun and interesting game in which you will ask your bridal shower party guests that what they think is the real logic or reason behind a certain wedding tradition. Here is the answer key so you can check the answers of your guests. I have made this game in three different color so that you can print it in color that matches your bridal shower party theme the most. How to Play:Distribute printed why do we do that game cards among your party guests along with pens or pencils and ask them to write down the reason behind different traditions. The guest with most correct answers will be the winner. Here is free printable game card for Why do we do that game for Bridal Shower. It is decorated with beautiful flowers and image of a bride. There are ten different traditions mentioned on this card for which guests will have to provide a reason. This is free printable why do we do that card in pink color. I love this color and you can print this game in pink if it matches your theme more. Just click on the image shared above and then right click and save the bigger printable image. 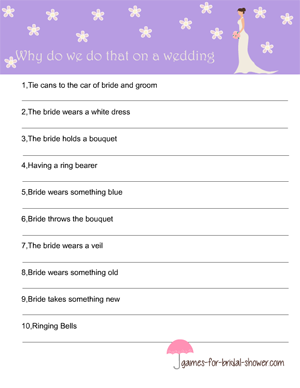 If you consider Lilac to be a more suitable color for your bridal shower party then print this free game card in lilac color. I hope your guests will enjoy these games on my website.